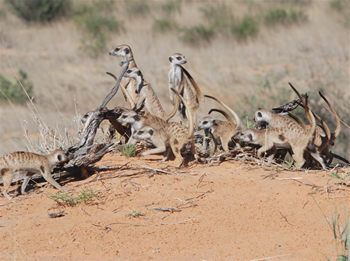 The Whiskers Mob is a succesful group of meerkats that own a two square miles area in the Turuman reserve. Their every move is recorded on camera by the Cambridge University who have made a documentary called Meerkat Manor (2005). The group came into existence in 1998, with four Young Ones females and two Lazuli rovers - reinforced with a wild meerkat who had been brought to us (instead of the potjie) from Van Zylsrus. Change came with a rover party of Vivian origin in 2001 who immigrated into Whiskers, with the brothers Youssarian and Zaphod taking turns in male dominance. In early 2002, Flower took over female dominance and has ruled Whiskers since then. She succumbed to a snake bite in January 2007, and her daughter Rocket Dog rose to power. After her death Ella established dominance; she was soon joined by Thundercat, a single Lazuli rover. The group recently recovered after a low in numbers. At first the dominant female was Holly from the Young Ones. In 2000 Holly mated with a former dominant male of the Rascals group called Kine . He was a roving male and the real father of Flower. Holly is the mother of Flower and is Risca's aunt. Holly died in 2000, and then Risca took over leadership. After an influx of Vivian Mob males, Risca lost her dominance to Argon and Holly daughter, Flower's older half sister, Vialli. Vialli was killed after having only one litter and then Flower took over. Flower led the group until 2007, when she died of a snake bite. Her daughter, Mozart, was most likely to become the next dominant female, but she joined The Starksy Mob, a mob mostly made up of Whiskers females. Now the dominant female is Rocket Dog, Kinkajou's littermate. The Vivian males immigrated soon after Holly's death, and Izit was the first dominant male. Soon after, Zazu temporarily took dominance but was overthrown by Zaphod. In 2003, Youssarian overthrew Zaphod after Zaphod had fought with Phooey and Alexander. He remained dominant until next year when Zaphod overthrew him again. Zaphod is probably the father of 9 of Flower's litters, but Yossarian may be father to two. A Gattaca rover also might have fathered one litter. Zaphod had also maybe given Yossarian his scar, above the left eye, in the dominance fight that made Yossarian the dominant male. After that, Zaphod and Flower were the Dominant Couple until Flower's death in January. Right now, Zaphod imigrated into Monkulus's (known as 'Maybelline' on Animal Planet) group she formed, named the Aztecs, and he is dominant male with Monkulus. The Whiskers are now lead by Flower and Zaphod's daughter Ella (known as Mungo as a pup in season two, and Sophie as an adult and babysitter in season 4). The current dominant male is Thundercat (Squeak on Meerkat Manor) of the Lazuli. The Whiskers on babysitting duty. 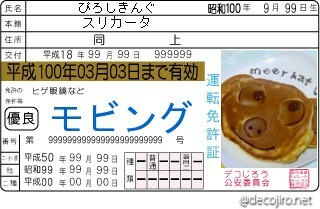 Ella was born on August 26th, 2005 in the Whiskers Mob with one sister, Billy and two brothers, Miles and Baker. Ella is the daughter of Flower and Zaphod. Ella, Billy, Miles and Baker all survive their first year. At the end of 2006 Ella got pregnant, her mother soon died and before, after her death Ella, Flo, Petra and Hawkeye gave birth to 8 pups, Burdock, Rhogan Josh, Amira, Squig, Cheriqui, Rufus, Etosha and Murray (the mothering of each pup is unknown). Rhocket Dog took dominance. During the end of 2007, Rocket Dog began evicting females from the group. Ella's two brothers left the group with three other males and joined The Commandos Mob. Rocket Dog evicted Ella on January 2008. However, Ella came back in the group and gave birth. Ella's sister Billy started a new group with Flo and Bananas called Van Helsing Mob. On February 7th, 2008 Ella gave birth to two females, named, Oriole and Sabota and one male, named, Marico. Amira also gave birth to one male, named, Juno. Then in April Rocket Dog was run over by a car so Ella became the dominant female. After 5 whiskers males left the group to join the Lazuli Mob, (Wollow, Michu Pichu, Rufus, Axel and Rhogan Josh) a Lazuli male named Thundercat joined the Whiskers (He was kicked out by the Whiskers males). The group was down to 7 members in June. Ella, Thundercat, Nugget, Juno, Oriole, Sabota and Marico (Beaker and Amira mystiriously dissappeared on July 2008). On July 29th, 2008 Ella gave birth to a male pup, named Savuka. On October 14th, 2008 Ella gave birth to 6 pups, three females named, McGee, Enili and Popple and three males named, Rozza, Gump and Pumplemousse. All pups survived. Ella's next litter came on January, 2009, when she gave birth to Marxxs, VWM137, Mimaji and Pitio. All were males. Shortly after the four was born the Whiskers encountered Kung Fu Mob in March. The fight went on for almost an hour before the Whiskers were forced to retreat but, Popple and Pumplemousse disappeared from the group. They were lost and then in April VWM137 was predated. At least, Ella, with Thundercat at her side can be a great leader. In the second season of Meerkat Manor, Ella was renamed Mango, and was seen as a pup. In the fourth season of the show, Ella's name was changed again to Sophie and she is seen as a babysitter, and as the new dominant female of the Whiskers. However, the "Sophie" character was actually played by three different meerkats. The real "Sophie" character was Mozart's first pup but died when she was about a month old in the well-known Youssarian ''accident''. Her sister, Tina Sparkle, took her name and later, Flower's (Mozart's mother's) daughter, Ella/Mungo (Mozart's smaller sister). Watch the video The Truth of Sophie. It should solve the majority of questions and confusion.